All homes are not created equal. Most properties fall near the median home price of a given area. Other homes, however, deserve special attention. Luxury homes have a high price tag, more sophisticated buyers, and require additional knowledge and experience over typical home purchases. 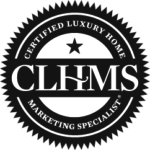 Top performing agents are eligible to complete the Certified Luxury Home Market Specialist (CLHMS) designation. Katrina Stone has earned this prestigious designation through documented performance in the TOP 10% of her markets, and has successfully demonstrated expertise in the luxury home, farmland and estate markets.